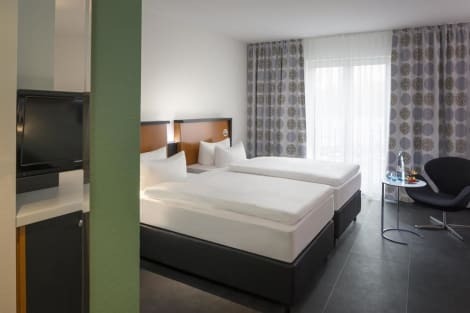 Quiet Neuss hotel with large rooms, free WiFi and fast tram access to the heart of Dusseldorf The Holiday Inn® Dusseldorf-Neuss is a short walk from the historic centre of Neuss. From the Langemarckstraße tram station, just 10 minutes' walk away, it's a 15-minute ride to Dusseldorf city centre. The hotel offers parking for a daily fee and Dusseldorf Airport is 20 minutes away by car. Neuss, one of the oldest Roman settlements in Germany, offers plenty of sights. Shopping is close by too, at Rheinpark-Center Neuss mall. Dusseldorf’s Altstadt is packed with bars, restaurants and cultural venues. Go shopping on Königsallee, one of Europe leading luxury shopping streets, or stroll along the Rhine promenade, both just a 15-minute tram ride away. Host up to 350 guests in the hotel's six naturally-lit meeting rooms. There's free WiFi throughout the building and a 24-hour Business Corner. The Toshiba and 3M headquarters are nearby and it’s a 20-minute drive to Congress Center Dusseldorf and Messe Dusseldorf. Rooms feature a pillow menu for a perfect night’s sleep. Family rooms and suites come with a kitchenette – and kids stay and eat free. Wake up to a breakfast buffet then savour traditional German and international dishes for lunch or dinner in Amaroso Restaurant. Relax in the sauna before enjoying a drink in the Sports Bar or in the Beer Garden during summer. With a stay at Dorint Kongresshotel Düsseldorf / Neuss in Neuss (Innenstadt), you'll be within a 15-minute drive of Duesseldorf-Hafen and Rhine Promenade. 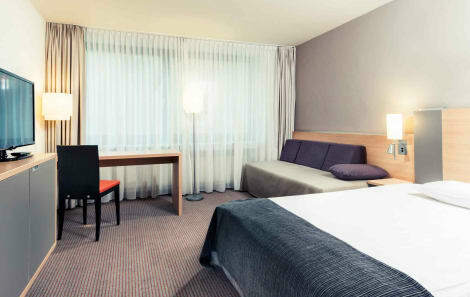 This 4-star hotel is 7.5 mi (12.1 km) from Messe Duesseldorf and 4.8 mi (7.8 km) from Konigsallee. The hotel offers private parking in the underground car park. Due to its central location, all locations in the city center are within walking distance. Hotel guests can enjoy their breakfast in the hotel restaurant. All rooms have a hairdryer. Wifi Internet access is available throughout the house. Almost all rooms have a balcony. With a stay at Novum Hotel Viktoria Neuss, you'll be centrally located in Neuss, within a 15-minute drive of Duesseldorf-Hafen and Port of Neuss. 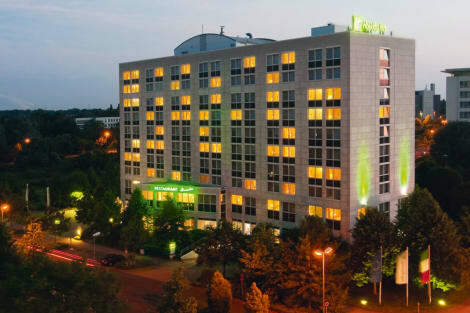 This hotel is 11.7 mi (18.8 km) from Messe Duesseldorf and 5.8 mi (9.3 km) from Rhine Promenade. The Rhine and Düsseldorf are just a stone's throw away and the Düsseldorf exhibition center and city of Cologne are close by too. 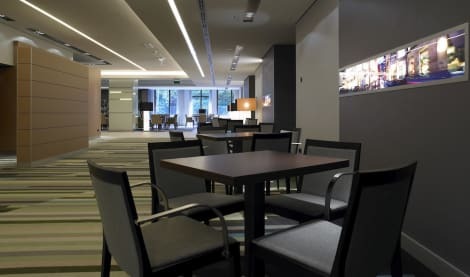 The 4-star Mercure Hotel Düsseldorf Neuss has 115 rooms with WIFI as well as an events area with six meeting rooms for your meetings, seminars or parties for up to 130 people. There is an S-Bahn station near the hotel, from where the line 11 takes you quickly to Düsseldorf and Cologne. Düsseldorf Airport is 12.4 miles away, or you can reach the hotel via the A57 highway. Make yourself at home in one of the 40 guestrooms featuring refrigerators and flat-screen televisions. Complimentary wireless Internet access keeps you connected, and cable programming is available for your entertainment. Bathrooms have showers and complimentary toiletries. Conveniences include phones, as well as safes and desks. Crowne Plaza Düsseldorf - Neuss located in Neuss directly on the banks of the River Rhine with wonderful skyline views of the fashion and media hub of Dusseldorf and only a few minutes away from the city’s famous Old Town. A modern 246 bedroom hotel with extensive meeting and events facilities and car parking. The hotel is easily to locate from the A57 & B1, and only 25 minutes driving time from Dusseldorf Airport. Dusseldorf City Centre is a short drive across the River Rhine. Explore the city with the famous shopping boulevard Koenigsallee where you will find upscale designer flagship stores and exclusive boutiques or visit the Altstadt, Düsseldorf’s famous old town home to chic cocktail bars and restaurants. The hotel's popular 4,000 sqm conference centre comprises of 16 meeting rooms accommodating conferences and events for up to 2,500 guests. Our Crowne Plaza Meetings Director will take care of the details, leaving you to focus on business, with complimentary Wi-Fi throughout the hotel. Start the day with a buffet breakfast in our Riverside Restaurant. Enjoy our dinner menu with influences from around the world or relax in the RiverBar with a cocktail, local beer and bar food menu with regional specialties. Dive into the 110 sqm swimming pool, workout on the latest fitness equipment or unwind in the sauna and steam room. The entire team of the Crowne Plaza Düsseldorf – Neuss is looking forward to welcoming you. Grab a bite from the snack bar/deli serving guests of ibis Styles Düsseldorf - Neuss. A complimentary buffet breakfast is served daily from 6 AM to 10 AM. Featured amenities include complimentary newspapers in the lobby, dry cleaning/laundry services, and a 24-hour front desk. This hotel has 14 meeting rooms available for events. Free self parking is available onsite. 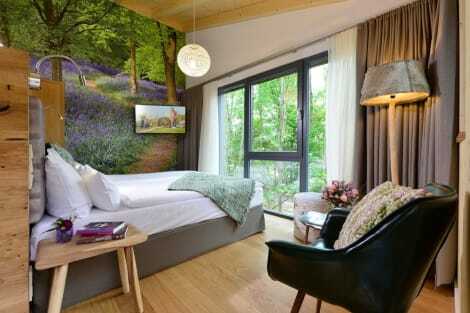 This charming hotel is located in Neuss. Commundo Tagungshotel Neuss features a total of 240 units. Pets are not allowed at Commundo Tagungshotel Neuss. lastminute.com has a fantastic range of hotels in Neuss, with everything from cheap hotels to luxurious five star accommodation available. We like to live up to our last minute name so remember you can book any one of our excellent Neuss hotels up until midnight and stay the same night.